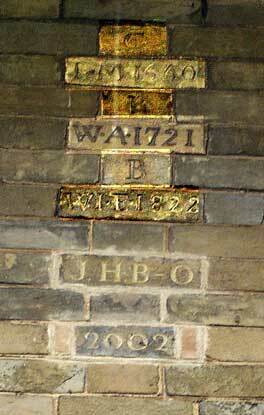 These bricks high on the South wall of Brinton Hall record dates when the house has undergone major remodelling. The Brinton Hall estate has very ancient history these bricks record dates of changes to the house over the last three and a half centuries. In 1660 Robert Cooke and Mary? Cooke owned the property. The 'R' is not clear where the brick has weathered, but enough is visible in an enhanced image and through binoculars to confirm that the letter is 'R' rather than 'I'. 1660 was the year that Robert's daughter and heiress Cicely Cooke was born. Cicely married John Brereton of Shotesham, and thus Brinton came into the hands of her Brereton descendants. The next date recorded, 1721, is that of William Brereton a lawyer. He was Cicely and John's son. His wife was Anne Shorting, the half niece of the Norfolk Admiral, Sir Cloudesley Shovell. William and Anne's great grandson was William John Brereton, who was the proprietor of a country bank and who married Elizabeth Hale daughter of John Hale of Worcestershire. When they remodelled the house in 1822 giving it its present Georgian character, William John's father, John Brereton, a merchant and farmer, was still alive age 78 and he died the following year. The hall was sold out of the family in 1869 but then repurchased in 1906 by Cuthbert Arthur Brereton, a civil engineer, and it was finally sold in 1922 to the Hemingway family. In 2002 the present owner, Jeremy Hemingway Bagnall-Oakeley, carried out a major restoration programme removing many of the piecemeal victorian modifications and restoring the house closely to its 1822 Georgian style.